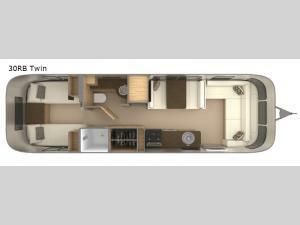 For the ultimate family-friendly travel trailer you will want this Airstream Flying Cloud 30FB! You will enjoy all of the added touches throughout that make this model even more user convenient. In the rear left corner there is a rear bed with a bunk above. The rear bathroom is spacious with a shower, toilet, and sink. There is enough space around the u-dinette for your whole family to enjoy your meals or in the evening you can convert the dinette into additional sleeping space, if needed. The front bedroom is ideal for mom and dad. Here there is a queen bed plus two wardrobes for any hang up clothes.